I'm not huge on decorating for the holidays, simply because we don't have the space to store decorations, but the one thing I do do each holiday is make a garland. Garlands are a fun, simple and festive way to decorate for the holidays plus they're small so easy to store! The garland I made for Easter this year uses some very thrifty supplies. For instructions and more pictures click on the link below. Upholstery needle (blunt compared to a normal sewing needle and thicker and longer, with a wider thread hole). Step 1: Cut out the bunnies from the template, then trace them onto the paint card samples and cut out (I have 10 bunnies per 1.25 metre long garland). Step 3: Thread your upholstery needle with the baker's twine. Pierce through the centre of each pom pom with the needle and space them out evenly along the length of your baker's twine. 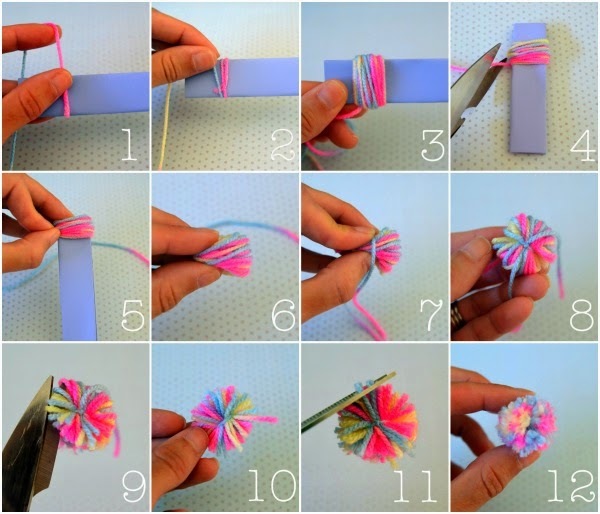 Step 4: Place a bunny between each pom pom and either glue or use washi tape to secure the bunnies to the baker's twine. Step 5: Secure the garland (I used blue tac) to your mantel, bookshelves or the like and enjoy your new holiday decor!